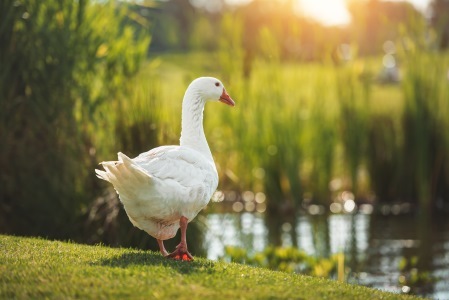 When someone is on a “wild goose chase,” they are pursuing something that seems to be pointless or unattainable. Example: Simon is deep within a forest. He’s attempting to take a photograph of a rare turtle that lives there, but first he has to find it. It’s been three days, and Simon is starting to believe he’s on a wild goose chase. He’s unsure if he will ever find one. In other words, he thinks trying to locate this rare turtle is pretty much impossible and is thus not worth the time. It’s believed that this phrase’s origin is rooted in some type of 16th century horse racing. Apparently, back then, a “wild goose chase” was a horse race in which the lead rider would be pursued by other riders, which is said to be similar to how geese flying in a formation will follow the one in the lead. However, the rules and details of this sort of race don’t seem to be very clear; the opinions on it vary. I was searching for my cat all over the house but I couldn’t find her anywhere. It really felt like I was on a wild goose chase, but then I remembered that I let her outside this morning. Jake had a laptop that wouldn’t turn on, so he called customer service to try and get it repaired. They kept redirecting his call and then his call would disconnect randomly. This whole process was taking forever. He felt like he was on a wild goose chase trying to get his laptop repaired. Note: While this is not the case for all common phrases and idioms, when it comes to their origin, sometimes it will not be clear. In such cases, what you’ll usually see are theories or guesses that take a gander as to where the phrase may have come from, but these may not be accurate.